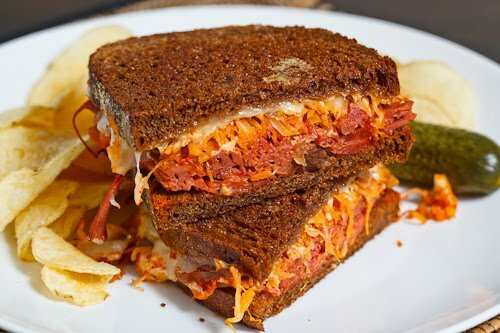 A reuben sandwich with the spicy hit of butter sauteed kimchi. I had still had some corned beef left over and with corned beef, cabbage and kimchi burritos and reuben sandwiches on my mind, I naturally thought about combing them to create the kimchi reuben sandwich. This reuben sandwich has two forms of fermented cabbage with the sauerkraut and the kimchi and the combination is pretty amazing. The sauekraut brings a nice light tanginess and the kimchi brings some flavour packed heat. As with the regular reuben, you have to be concerned about the amount of liquid going into the sandwich and I find the best way to deal with it is to lightly saute the sauekraut and kimchi to remove any excess moisture. I have to say that I quite enjoyed the heat that the kimchi added to the sandwich and the kimchi went particularly well with the creamy Russian dressing to which I added a touch of gochujang. Melt the butter in a pan over medium heat until it bubbles, add the kimchi and sauerkraut and saute until most of the moisture has evaporated, about 2-3 minutes. Heat a clean non-stick pan over medium heat. Butter the outside of each slice of bread, sprinkle half of the cheese on the inside of one slice of bread, top with half of the kimchi and sauerkraut, half of the russian dressing, the corned beef, the remaining russian dressing, kimchi and sauerkraut, cheese and finally the other slice of bread. Add thesandwich to the pan and grill until golden brown and the cheese has melted, about 2-4 minutes per side. Mayonnaise and gochujang combine to form a wonderful combination of creamy and spicy and it works amazingly well in a Russian dressing. i love kimchi and never thought to use on a reuben. Kevin you just rocked my reuben world! Kimchi reuben – that's genius! This is positively genius! 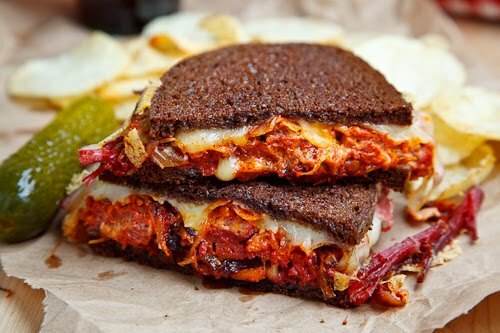 Love kimchi, love Reubens…such a fantastic fusion sandwich!!! Can't tell you how in love i am with this idea! Bravo!! My gosh, this (and that burrito you posted recently) looks ridiculously good! I love reubens. I'd love to try some with kimchi. How unique! That sandwich sounds great. Thats a nice tip about how to control the moisture of the sandwich. Thanks for posting. I made a video about a Kimchi Reuben sandwich a couple of years ago but you took it to the next level. I knew you were going to add kimchi into the mix somewhere! Your recipes have been amazing but I have one question about the bread…how do you keep it from scraping the crap out of your gums and the roof of your mouth?! Sometimes I almost prefer a soggier sandwich because the moisture softens the bread. Your recipes are amazing and I love that you're combining the leftovers. I have one question though, with all the moisture that you're drawing out of the sandwich, how do you keep the bread from scratching the crap out of your mouth?! I appreciate a non-soggy sandwich but sometimes the added moisture makes the bread a bit more pleasant. Nice heat and spice in this one! 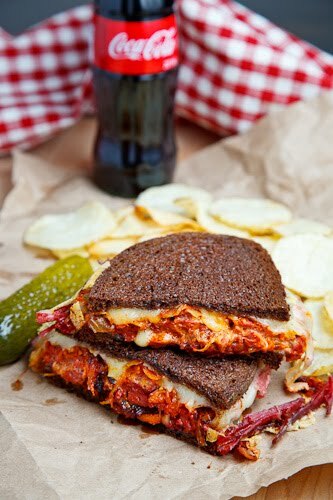 Reuben sandwiches seem to be a running theme on the blogs I read lately! This looks so tasty, I'm actually going to make myself something to eat soon because it's made me hungry lol! that looks intense! nice flavor combo. hungry! You combined two of my most favourite things in the world; kimchi and the rueben! Genius! Too many delicious sandwiches to know which one to appreciate most. Lovely blog. I just did a post today about how Asian fusion is back "in". This is a perfect example of the right way to do it, yum I love kimchi! 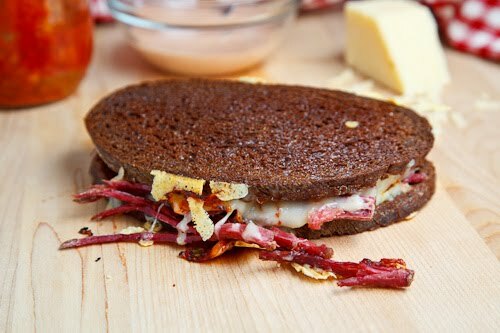 I love this take on the Reuben! Although, I must confess, that i've never actually had kimchi before…but it sounds delcious. I tried my take on a Reuben pizza over the weekend (okay, I didn't exactly use tradtional Reuben ingredients but I was trying to use what I had handy – I'm still calling it Reuben though!). Holy shazam, experiencing a Pavlovian response right now, this looks so good! Genius! Of course hearing you talk about it, this seems perfectly logical, but I don't think it ever would have occurred to me on my own. Thank you for sharing your inspiration! Can't wait to try this. How come when I click on a recipe that looks delicious, I get sent right to you? Can't wait to try this! I must try kimchi then too! What a delightful sandwich. Thanks for this post. Great idea. Why not substitute (or add on) one type of cabbage for another. Brilliant! I absolutely love your blog for making such adventurous combinations seem so sensible, yet never obvious. 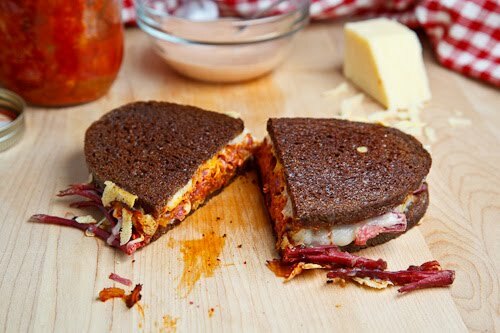 I don't even NEED the corned beef but just give me a kimchi grilled cheese with all the other fixins'! Yum! Such a nice surprise to see your comment on my blog, and good to hear from you. I lost my hard drive a few months ago and it's been hard to remember all the blogs I subscribed to. Resubscribing to Closet Cooking. I've only had kimchi once, prepackaged from an Oriental market. Didn't care for it, but I do realize it was just one sampling and I know there's better out there. Great idea for the sandwich. What a novel and inspirational use of kimchi. You've taken an aready lovable ingredient and combined it with a classic sandwich. Inpsirational! such a clever fusion food i can get down with!! dont eat meat, but came across this and have to say it looks amazing. great job, what a wonderful idea! Hi Kevin, that first picture really jumps off the screen. When Apple finally gives us 3D iPads, it's going to be hard to resist not opening my mouth while staring at the food images on your site. this looks so good. we have this korean truck that sells kimchi quesedillas, and I love it. the smell of it.. like butter. i bet this tastes divine. Looks like something my husband would just love. I will have to make it!! I love kim chi, we make hundreds of gallons each year. We also have used it for many of the same things I see here including dressing up a burger and shredded on hot dogs or sausage. For anyone interested in making kim chi I have a recipe and photos posted on the blog I just started.